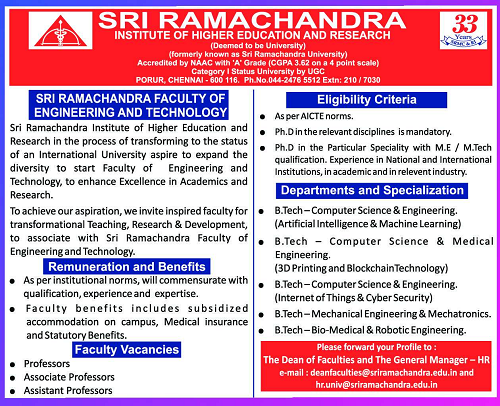 Sri Ramachandra Institute of Higher Education and Research, Chennai has advertised in THE HINDU newspaper for recruitment of Professor / Associate Professor / Assistant Professor jobs vacancies. Interested and eligible job aspirants are requested to apply immediately from 30th January 2019. Check out further more details below. About College: Sri Ramachandra Institute of Higher Education and Research (Deemed to be University) is located in Porur, on the busy Chennai – Bangalore highway, a twenty minute drive from the Chennai international airport. Chennai is a busy metropolis situated at head of sixty miles of pristine beach in the Bay of Bengal. Chennai is a fast growing industrial, medical and knowledge hub in South India that retains its charm, tradition and culture. It is well connected by road, rail and air to almost any destination in the world. Ph.D in the Particular Specialty with M.E / M.Tech qualification. Experience in National and International Institutions, in academic and in relevant industry. How to Apply: Interested and eligible candidates are requested to send application with CV, copies of certificates and recent passport size photo to the email address provided below.